In this glorious novel set in the 1680s, science and religion go head-to-head in a duel as the rays of the Enlightenment can be seen in the horizon. Angus, a young peasant boy on the mystical island of St. Helena is tasked by his tutor, Edmond Halley, to mark out the constellations in the night sky to hone his eyesight to be as sharp as any sail needle. While diligently carrying out his duties, Angus dreams of London and of learning more from his master who has returned to the motherland. A devastating act of violence, directed at Angus’s own family, marks the beginning of restless times on the island. The secret Catholics conspire, and the island’s autocratic governor furthers his own interests. Angus is stowed away on board a ship bound for England, a secret note sewn inside his shirt, intended for Halley to pass on to the English authorities. As Angus’s new life begins in the heights of the ship’s crow’s nest, who could have foretold the humble boy’s journey to become an astronomer’s apprentice and to play a role in the history of science? "Finnish literature changes to world literature in the hands of Olli Jalonen." 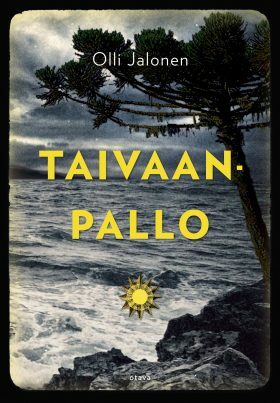 "Jalonen’s language is enchanting, ponderous, rounded and beautiful. The rhythm, the word choices, and the word ordering were among many reasons why, while reading, I never knew if I should devour the text or advance as slowly as possible." "This is fiction at its best: times, places and the age and gender of the characters are not relevant when the narrative constructs a reality which is nothing short of true, right there to sense and to grasp at the moment of reading. I am at the feet of a great story ... This work speaks to me on many levels and disentangles how we are limited by time, position and our surroundings. " "An inspiring, emotionally exciting and thrilling story with a driving, adventurous plot... Handles effortlessly the fundamental dimensions of being human, as well as science, society and philosophy." "A truly dazzling, astonishing novel"